Working with chainsaws could be dangerous if not used correctly. To be able to prevent unexpected stress and injuries, ensure you’re using the greatest potential security gear, right working techniques as well as a modern chainsaw safety features functioning properly. Over 40,000 individuals are injured by chainsaws every year. How not to be one of them and how to use chainsaw safely? Back of the left hand and front left thigh are the two most frequent places for chainsaw injuries. Kickback is one of the main reason for chainsaw injuries. A muffler on a chainsaw can reach up to 900 deg F.
Don’t ignore any step. 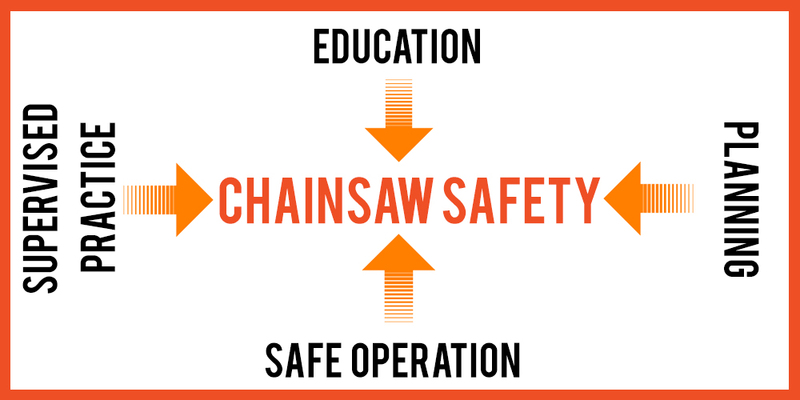 Follow all 4 steps of chainsaw operation for a safer experience. If the tool isn’t handled correctly or in case of a kickback, the kickback guard and chain brake ensure the chain stops instantly. The throttle lock is made so that the power saw only functions when you keep pressing a certain button. Make sure the guide bar is not touching anything. Make sure the chain brake is engaged. Keep your thumb underneath the bar. And use your right hand to hold the back handle so you can easily get to the stop switch as well as the accelerator latch. Limbing means removing branches from fallen tree. Bucking means cutting a log into sections. Step1: A felling notch shouldn’t exceed 20% of the tree’s diameter. Step2: The hinge is 10% that is left uncut for safety purpose. Step3: The last step is the felling cut on the opposite side of the tree from the felling notch. But shouldn’t go all of the way through the tree. Quick fact: Kickback is one of the greatest cause of injury to chainsaw users. It causes the chainsaw to “kick back” towards your face which is very common and cause serious harm. Vibration syndrome is not very common now-a-days because new technology were invented and most of the latest chainsaw has this anti vibration feature. Wear a helmet cause falling branches are enough to kill you. The tree that you are cutting sometimes may drap or snap other trees. To prevent this first free the branches of the tree you are cutting. Turn of the chain saw and escape when the tree starts to move. Plan an escape path to prevent injuries due to stump hop. This happens if the crown of the tree that has been felled or a closeby tree shatters or snaps. This causes hurling branches and certainly will cause death or serious harm. While cutting never stand in the back of the tree. A proceeding or rolling tree can catch your legs or destroy you. This can happen when limbs are removed. Prevent this just by staying uphill from a tree on a slope. A tree may become arched when it is felled or if another tree falls on it. It may strike out at anything in its path. Always stay inside the bow of a springpole. Use Personal protective equipment (PPE). Make sure you’re properly dressed and equipped for the task. This could reduce injuries and stop death from chainsaw injuries significantly. All chainsaws come with some required safety features like chain break. If kickback happens, the inertia of the front guard should activate the chain brake immediately to stop the chain. When you arrive at the working site, it’s time to plan for the felling. To begin with, ensure that nobody is within a space of at least twice the tree height from the tree you plan to fell. Examine the tree to see if it’s been damaged by decay or cracks. Most trees have a natural falling direction. Move away a little to check with a plumb line if you are not sure of the tree lean. You can drive a tree to fall against its natural falling direction, but this requires knowledge, expertise as well as the correct felling support tools. Trees with poor lumber, like decayed or dead trees, should be felled in the easiest direction. Lastly, here are suggestions for handling the chainsaw. Use your both hand to control chainsaw. Using appropriate techniques will minimize the threat of injury. Wrap fingers and thumbs fully around the handles and hold your left hand thumb below the front handle to cut back the force of a kickback. Hold it close to your body to get proper balance and accuracy. The best functioning posture is with your left foot in front of your right and with your knees, not your back bent. Stop the chain before you move to another stop. Ensure on one is within 3 meters when you are cutting. Always Keep the chain saw handle dry and clean. Make sure the handle is free from fuel or oil. Never try to cut anything other than woods. Don’t hesitate to take a course if you are an absolute beginner. Practicing alone may cause you to learn wrong technique. Have your gear checked regularly and make sure the safety features are functioning. Clear loose debris and remove combustible materials from the area. When to call a specialist? If there are other obstacles to the tree. Always be careful even if you are an expert. Wear the right clothing, pay attention to your own environment, and call a professional if you are uncertain to perform the job safely. Be alert and be alive! Wear and make use of the personal safety gear that is proper. You’ll need boots with steel capped toes, a safety helmet, safety pants or chaps, earmuffs, eye goggles or visor. Don’t wear anything that is loose fitting. Check and make sure everything including the safety features are functional before using. Start the chainsaw on the ground, with nothing obstructing chain and the guide bar. Plan your cutting job and try never to use a chainsaw when you are alone. Don’t forget to keep a firm with both hands, this reduces the chance of losing your control from the chainsaw kicking back. Never cut on branches above shoulder height. There are special techniques used in cutting down a tree on heavy lean. You need to exceptionally cautious. You might want to do a course and learn the techniques. Ensure that the chainsaw has come into a full stop before putting it on the ground. A chain should be tensioned properly so that it touches the bar the whole way round else could kickback and may cause an accident. A loose chain also affects the cutting. Follow the manual for maintenance and sharpening. Keep your work space nicely lit and clean. Don’t use power tools In the existence of dust, gases, or flammable liquids. Cause power tools can create sparks which might ignite the dust or fumes. Keep children, bystanders, and visitors away while using a power tool. Distractions may cause you to lose control. Protect others by providing barriers or shields as needed. Grounded tools have to be plugged into an outlet correctly installed and grounded. If required check with a qualified electrician to ensure the outlet is correctly grounded. Double Insulated tools are designed to use a polarized plug. Don’t alter the plug in any manner. Avoid body contact with grounded surfaces. Electrician’s rubber gloves and footwear will improve your personal safety. Don’t expose power tools in wet conditions or to rain in anyway. Water will raise the risk of electric shock. Don’t abuse the cord. Don’t use the cord to carry the tool or to pull the plug. Keep cord from heat, oil etc. Replace the damaged cords immediately. Use “W-A” or “W” marked extension cords when operating outside. Cause these cords are rated for outside use and decrease the possibility of electric shock. Remain alert and careful about what you are doing. If you are tired enough, take a break. Dress correctly. Tend not to wear jewelry or loose clothing. Keep your own hair, clothes, and gloves away from moving parts. Keep handles dry, clean and free from gas and oil. Avoid unintentional starting. Be sure to switch it off before plugging. Remove adjusting keys or wrenches before switching the tool on. Tend not to overreach. Keep appropriate balance constantly to avoid unexpected situations. Use safety gear like eye and hearing protector, musk, non-skid shoes, helmet etc. Support and secure the workpiece to a stable position. You can use clamps or any other thing but don’t use your body or hand to hold it. It may cause to lose the control. Don’t force the tool. The right tool is going to get the job done better and safer for which it is designed. Don’t use any tool if the on/off switch is damaged. Repair it before using. Disconnect the plug from the power source when you are done or making any adjustments in the tool or changing accessories. Store idle tools out of range of children as well as other untrained individuals. Maintain your tool properly. Keep the cutting tools clean and sharp. Check before using if every parts are functioning properly. Many injuries are due to poorly maintained tools. Use only manufacturer’s recommended accessories for your model. chainsawmag.com is a participant in the Amazon Services LLC Associates Program, and we get a commission on purchases made through our links.